Peter Martin: We felt well-governed under Rudd? Who would have thought it? We felt we were well-governed during the Rudd era - much better governed than for most of the Howard era. The finding will be published next month by the Australian Centre on Quality of Life at Deakin University as part of its wellbeing project. 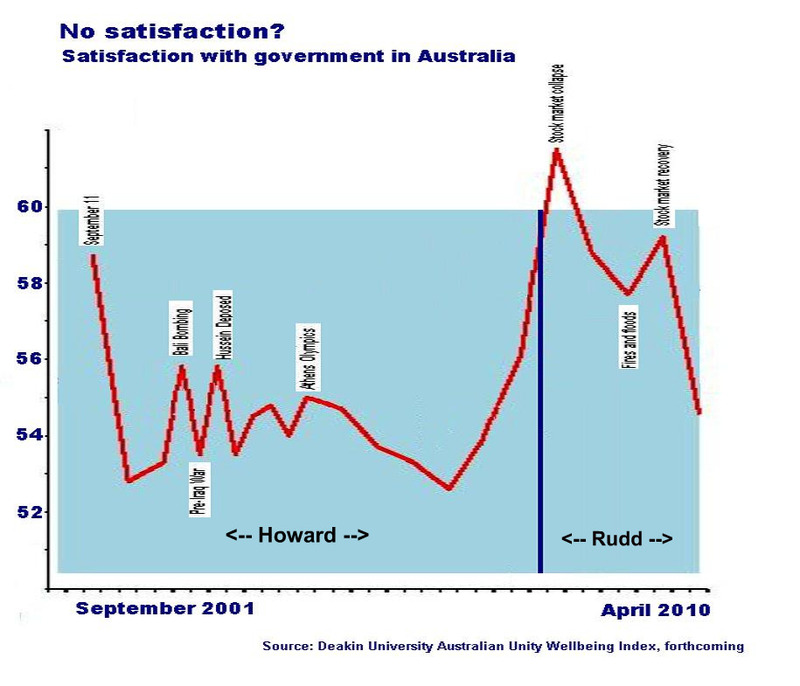 Since September 2001 it has been asking Australians to rate on a scale of 1 to 10 how satisfied they felt with government in Australia. The September 2001 result was an index number of 59 meaning that on average Australians gave the government close to 6 points out of 10. But it turned out to be the Howard government's highest score ever got, pushed up by the Twin Towers bombing in the United States just days before. "It was a rally round the flag effect," said Deakin Professor Bob Cummins... "When things look threatening people look to their leaders and tend to find they like what they have." After that the Howard government's rating rarely went above 55 despite blips during the Bali bombing and the toppling of Saddam Hussein in Iraq. By contrast the Rudd era began with the best numbers on record. Satisfaction with government soared to 62 points on Rudd's election and remained well above the Howard government's average until the most recent survey in April this year. "Even in April this year people were more satisfied with government under Rudd than they had been under Howard when they re-elected him," said Professor Cummins. "I think the plotters who deposed the prime minister may have misread the feeling of the electorate by focusing on the change in its feeling rather than its absolute level." "It's the sensation you get when you take your hand out of water of one temperature and plunge it into water of another," he said. "It isn't a reliable guide." "People got so used to high satisfaction with government they panicked when they saw it change." 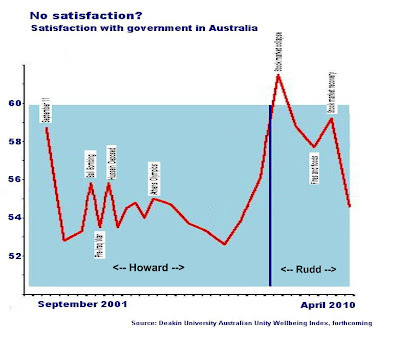 Satisfaction with government soared to a record high under Rudd during the 2008 world stock market crash in the wake of the collapse of Lehmann Brothers. But Professor Cummins doesn't think that was a result of voters "rallying around the flag". "We rally around the flag when things are bad somewhere else, such as Bali or New York,' he said. "We feel protected and secure because it is happening to someone else." "The global financial crisis was different. I think in we felt satisfied with government not because of the crisis but because of its response to it." "Whether or not giving most of us cheques for about $1000 was a good idea, it made us feel the government was doing something, that it was on top of the problem." "Until very recently we believed we were exceptionally well-governed under Rudd. In most other countries the scores are below 50 - Rudd at his worst fell to 54, Howard to 52. It might be that we are well governed compared to many other places." "We will never know whether Mr Rudd would have been re-elected, but if people voted on the basis of how they felt about government he might well have. We felt good." On some other dimensions we are feeling better than ever. The survey finds our satisfaction with social conditions, with our personal relationships, with our standard of living and with the natural environment has climbed to an all-time high.
. What is it with shoes?